Hi friends! Sambar is a very delicious and popular dish from South India. It is served with steamed rice or with idli, dosa. Sambar is served with rice as the main course in everyday South Indian meals. 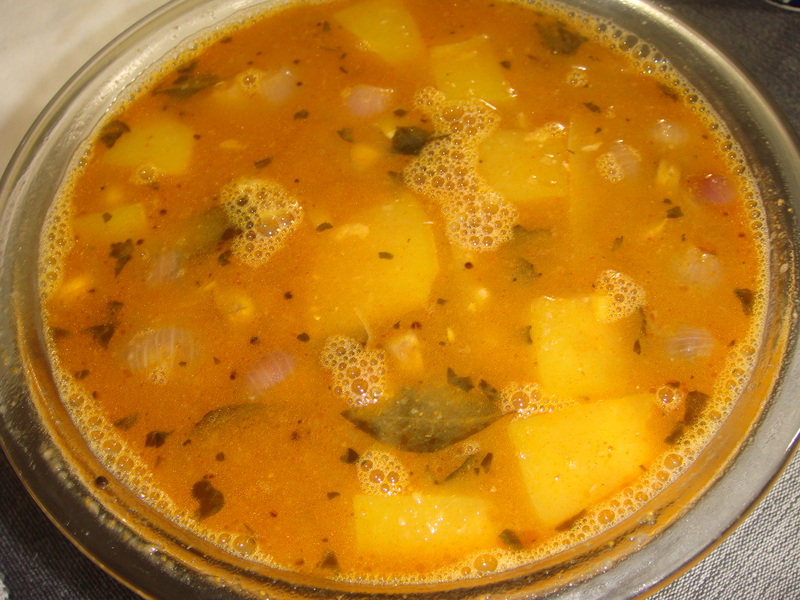 Sambar can be made with pumpkin or only onions or a wide variety of vegetables . Clean and wash tur/toor dal very well. Pressure cook tur dal with 500 ml of water and a pinch of asafoetida and salt. When the pressure is formed, reduce the heat to low flame and cook for twenty minutes. Switch off the stove. When the pressure subsides open the cooker, put the cooked dal in a large bowl and keep aside. Soak tamarind in hot water for 10-15 minutes and take out the extract, 1 1/2 cups of tamarind juice. Strain and discard the pulp. Heat oil in a pressure cooker, add mustard seeds. When mustard seeds start spluttering, add fenugreek seeds. Sauté for few seconds till slight colour change (don’t let it turn dark brown) and add curry leaves. Fry for a second and add onions. On medium flame, sauté the onions until they are translucent. Add tomatoes, drumsticks and pumpkin cubes. Fry these for two to three minutes on high flame. Then add sambar powder, tamarind juice and salt. Let it come to a boil. Reduce heat add the previously cooked tur dal. Add two cups of water and close the pressure cooker lid. Pressure cook on high flame until the pressure is formed, and then switch off the stove. When the pressure subsides open the cooker. Check the consistency of the sambar, it should not be too thick nor too thin. Adjust the quantity of water accordingly. If too thin, cook till it thickens, then switch the stove off. Serve with hot steamed rice idli, dosas. Note : If the sambar is to be served with idli and/or dosa, it should be thin consistency. If it is to be served with rice, it should be a little thick consistency. The taste of the sambar varies according to the sambar powder used. Toor dal contains folic acid. Getting adequate amounts of folic acid in your diet can help to reduce specific brain and spinal cord birth defects by more than 70 percent, according to the New York State Department of Health. This is because legumes such as toor dal are an excellent source of nutrients and plant protein, and they also contain dietary fiber. In essence, legumes are nutritionally similar to poultry, meat and fish, though they represent a low-fat and low-cholesterol alternative. Legumes such as toor dal provide essential nutrients, fiber and protein for vegetarians as well as those who wish to merely limit their meat consumption. Toor dal is also an excellent source of carbohydrates, which your body needs for energy. Legumes such as toor dal are a healthy source of dietary fiber, which can help to prevent constipation and promote regularity. A diet that includes healthy dietary fiber can also reduce your risk of chronic diseases. Hi Rohan ! Thanks for the appreciation !!! Experimenting is always good.